I’m pleased to announce the release of Geomancer’s Bargain: Book 1 of the Western Geomancer! For a limited time, I’m offering Geomancer’s Bargain at an introductory price of just 99 cents in the U.S. and at a comparable price in other markets. Don’t delay, or you’ll miss out on this special deal. I’ll be raising the price to $3.99 on Monday morning, February 29. Amazon.com (UK, DE, CA, AU). See * below for non-Kindle editions. 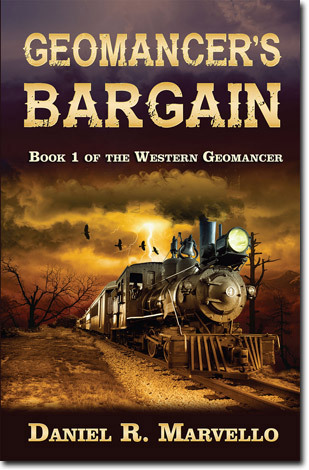 Geomancer’s Bargain is the first novel in my new western fantasy series. If you are a fan of weird westerns, steampunk, or historical fantasy, you’ll enjoy the adventures of Carleton Kazimer, Wizard of Geomancy. (In case you aren’t familiar with the term, geomancy is the practice of elemental earth magic.) The series is set in the Arizona Territory during the Victorian Era (specifically, the mid-1890s), but while the story world will be familiar to fans of the Old West, I’ve added a few new elements you won’t find in the history books, such as magic and several fantasy species—including dragons! If you’d like to know more about this new series, visit the series page on LogicalExpressions.com, the publisher’s site. For your convenience, I’ve included the description and cover for Geomancer’s Bargain below. Like many settlers, Carleton Kazimer traveled to the western frontier to escape something. In Carleton’s case, it was a notorious criminal gang who put a price on his head. But the young earth wizard quickly discovers that new and unfamiliar dangers await him in the wild west. A promising contract at a gold and silver mine in the Arizona Territory turns sour when the delvan miners who work the ore reject the assistance of a human geomancer. While trying to prove his worth to the impatient mine manager and the delvans, Carleton’s efforts lead to conflict with the indigenous avens who populate the local mountains and revere the area’s dragons. With few allies to back him up, Carleton must find a way to salvage his contract and build a new life in the lawless desert far from the civilization of home. Geomancer’s Bargain is a western fantasy adventure of approximately 80,000 words or 300 printed pages. For now, Geomancer’s Bargain is available exclusively in Kindle format* through Amazon.com (UK, DE, CA, AU). * If you want a copy for a device that can’t read Kindle books, get in touch with me through my contact page for instructions.